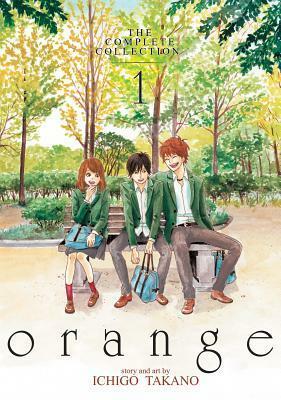 Orange is a manga series that will definitely pull on your heartstrings. Heck, before even starting the actual story, the first two art pages at the beginning about broke my heart by themselves. This story starts out with our main character, Naho, receiving a letter from herself ten years in the future. She and her group of friends are sixteen and in eleventh grade in high school, but what her twenty-six-year-old self is trying to warn her of is imperative. Future Naho informs present day Naho that she will lose the boy she likes if she doesn’t change some of the actions and choices she is about to perform and choose. This obviously makes Naho hyper aware of everything she and her friends are doing, because she is so scared she is going to repeat past mistakes and end up losing this boy anyway. The best part about this manga series is the phenomenal friendships. This book has one of the best circle of friends I’ve read about in years. They constantly are showing their unconditional love and support to each other, and are honestly a freakin’ treat to read about. Seriously, friendship goals. ➽ Naho Takamiya – Main protagonist, who receives the letter about what her life is going to be like in ten years, unless she changes some things. Very shy, very timid, a very sweet little cinnamon roll. ➽ Kakeru Naruse – The boy who will not be in their lives anymore if his friends do not change the past. ➽ Takako Chino – The more outspoken girl in the group. She always sticks up for Naho, since Naho is too shy for confrontation, and always just generally feels like the protector of the group. ➽ Azusa Murasaka – The happy-go-lucky one of the group, her parents own a bakery, and she’s always super excited and supportive of Naho. ➽ Saku Hagita – Manga lover in the group, who is also totally in love with Azu! ➽ Hiroto Suwa – Honestly one of the best characters, and most selfless humans, I’ve read about in years. He’s the leader of this group, one of the most popular boys in their school, an amazing soccer player, and proves his unconditional love over and love throughout this volume. 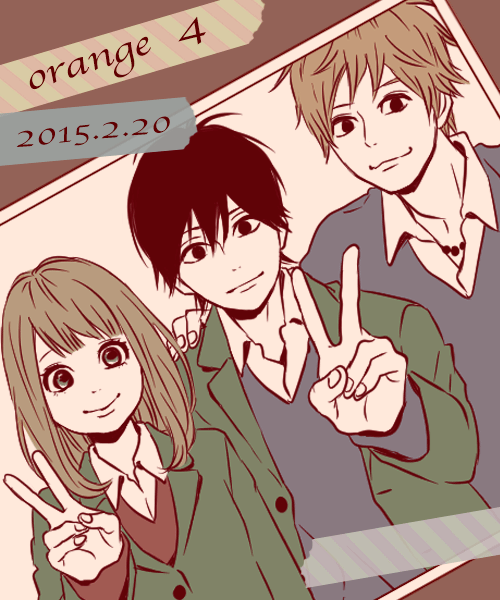 I could probably writes sonnets at this point about how much I love Suwa, and how I honestly just want him, Naho, and Kakeru to have a poly relationship where they all love each other, but this whole group of friends is amazing. I love their group dynamic and how they interact individually, too. They are all selfless, to be honest, and they all truly want what is best for their friends. They are a great support system for one another, and I love seeing them build and boost each other up. This manga series is also important, because it never shies away from the topic of suicide. It brings up great points, especially for high school aged kids, about how sometimes when friends joke about death, they aren’t really joking and to always take them seriously. On the flip side, it is also important to understand that sometimes the saddest people will mask their feelings with smiles and laughter, so always check in on the ones you love and make sure they are feeling okay. The art is beautiful, the story is lovely, and the messages are so very important. I loved everything about this, and I cannot wait to start the anime after I finish Vol. 2. ARC provided by Quercus in exchange for an honest review. I’ve been staring at this word document for far too long, because I simply do not have the words to describe how much I love this book and this series. Nothing I could say, and no word combination I could created, would do this series justice, but I suppose I should at least try. In my opinion, this is the closest thing to perfection in adult fantasy. 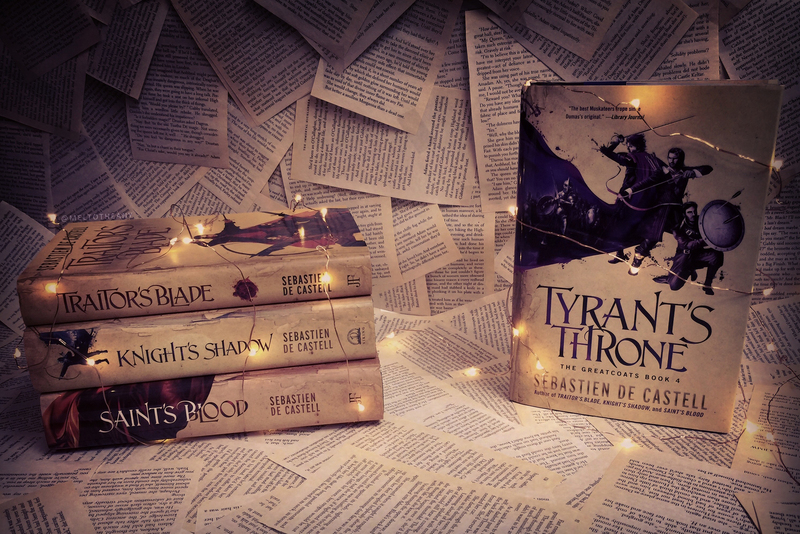 I have absolutely nothing bad to say about these four books, and as apprehensive as I felt about Sebastien de Castell finally writing a conclusion for this series that I love, he proved that he could do that perfectly as well. ➽ Brasti Goodbow – The King’s Arrow, the Queen’s Jest, the funniest character in all of literature, and the kindest soul in all of Tristia. ➽ Kest Murrowson – The King’s Sword, the Queen’s Shield, the moral compass, the always knowledgeable bookworm, and the little cinnamon roll that’s too good for this world. ➽ Falcio val Mond – The King’s Heart, my freakin’ heart, the leader, the lover, that smartass, the clever fool, the main protagonist, and maybe the best character ever written. Like you’ve probably heard a million times before, these three make up a very Three Musketeers like group, that travels through this country named Tristia, trying to keep their dead king’s dream alive. Upon their king’s death, he gave them each a secret mission to completely once he was dead. We learn of Falcio’s right away in Traitor’s Blade, and from there we are lead on an amazing journey filled with duels, wars, deceptions, politics, betrayals, twists, turns, love, and everything in between. Book four starts out in true Sebastien de Castell fashion, which is always in the most unexpected of ways, with our three beloved Greatcoats crashing a wedding performance in which another Greatcoat shows up to save the day, which totally just makes our Greatcoat’s day much harder. Then, in maybe more true Sebastien de Castell fashion, this ends up being a parallel for the entire book. This book also answers a lot of questions from the other three books, too. Like where the remaining Greatcoats have gone, and what King Paelis asked of the other Greatcoats. Like what Trist has been truly up to. And, probably most importantly, how are the Greatcoats going to reunite a country that is so very content with meagerly passing by? It’s so very difficult to say much more without jumping into spoiler territory. This is the fourth and final installment in this series, and it ripped my heart out and left me crying for the last couple hundred pages, but it was everything I wanted. This series means so very much to me, and I’ve never loved another fantasy series quite like I love Greatcoats. This series is so special and unique, with meaningful lesson after lesson on the importance of being kind and being good and to be just to other human beings. And that your past will never define who you can be. And how important friendship is, and how selflessly loving others is the most powerful gift you’ll ever have in this life. And that regardless of luck, you can make a difference, always. In my opinion, this series deserves just as much credit, praise, and adoration, if not more so, than The Kingkiller Chronicle, ASOIAF, Mistborn, and all the other popular high fantasy that is constantly talked about and loved and celebrated. And I love all of those too, but I love Greatcoats more. Please give this series a try, it’s truly masterpiece that I wish I could share with everyone I know. This final book comes out June 6th for us Americans and it is so very deserving of the recent hype it has received on Goodreads. 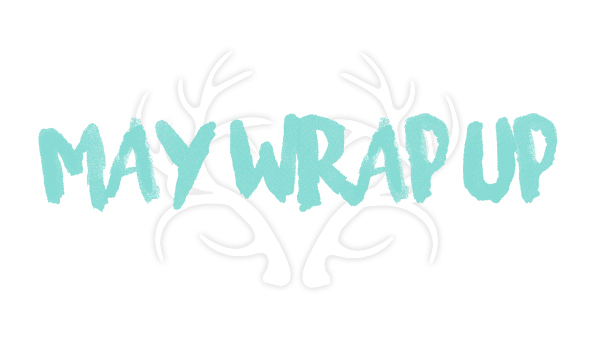 Okay, I can’t resist writing a spoiler section where I incoherently gush about my babies. Please do not continue on if you haven’t completed this series! MAJOR SPOILERS ahead! ➽ Aline – I have never wept for a character the way I have for Aline. 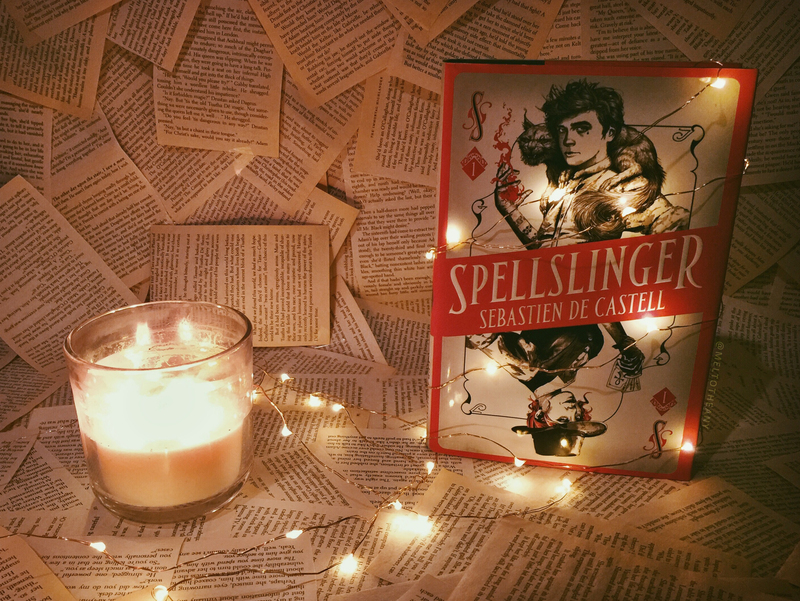 If I had to give a complaint about this book, it would not be that Sebastien de Castell decided to kill her, it would be that he brought her back for just my heart to heal a tiny amount, only to then break in a way I never thought possible over fictional characters. Like, I’m crying writing this paragraph, that’s how messed up this book made me. ➽ Monster – And then Monster coming back to take Falcio and the Tailor to bury Aline? Please, God, make these tears stop. AND SHE HAD FOULS? LITTLE FAE HORSE BABIES? Please, just, take all my money and make me a book about them. Seriously, how perfect. ➽ Trin – Girl, where did you go? And how are you my favorite villain of all time? Everything Trin does makes so much sense, while she also does nothing without reason. She wants to love so desperately, she was just never taught how to. Like, I love Trin. I know I shouldn’t, but my heart just breaks for her. I hope Sebastien de Castell comes back to this world soon, because I hate having resolution with everyone but Trin. ➽ Fillian – I read this book feeling like Fillian would perhaps get his own spin-off. And even though I hated Aline’s death, I loved the conversations of misogyny that Fillian becoming King (so easily) brought up. I mean, Fillian proved he would put his country first, I just feel like he is too mysterious for us to not learn a lot more about, eventually. ➽ Chalmers – And once Chalmers got appointed First Cantor, I couldn’t help but fully believe in a spin-off. I mean, maybe it is just a sweet ending, and Lord knows that Chalmers deserved that rank after what she had proven of herself during the war, but I still feel like we are going to learn a lot about her and her new king, Fillian. ➽ Darriana – God, I just love Darriana. Not only is she completely badass and always takes matters into her own hands, she somehow wormed her way into Brasti’s heart and he into hers. I loved that is going to reform the Dashini into what it should and could have been from the start. I only hope her and Brasti get a spin-off telling about their adventures and their love together. ➽ Tommer, God of Valour – Be still, my heart. Honestly, seeing the Gods of Love, Death, and Valour show up honestly broke me. I thought I couldn’t contain my tears during Aline’s death? Oh was I a sweet summer child. ➽ Jillard – Jillard was one of my favorite characters, but I knew he was living on borrowed time as soon as Tommer died in Saint’s Blood, but can we talk about his character development? I mean, what a perfectly crafted and written character, who was able to evoke every emotion of the spectrum from me. ➽ The Tailor – I know the Tailor isn’t the most beloved character of this series, but when I think about everything she has lost, and continued to lose, my heart becomes so very heavy for her. Another perfectly executed and morally grey character. ➽ Morn – The King’s Backstabber. Also, Sebastien de Castell’s twists and turns will never cease to surprise me. ➽ Nehra – I loved her and the rest of the Bardatti. Whenever I play or watch D&D, Bards are always the class that wins me over with minimal effort, and I fell in love with the Bardattis just as easy. I loved the impact of their war song, and I loved the message that music can change the world. I hope there is a heavy emphasis on them and their tales in future books. ➽ Feltock – I honestly was not expect this cameo at all, but it was so very welcoming. I loved the disabled representation, especially in a believable war setting from an actual war general. Feltock was such a wonderful addition to the ending of this book, and I am so very thankful for him and his impact on the war. ➽ Valiana – Valiana kind of missed the mark for me in this book. Like, I didn’t have a problem with her, but I constantly wanted her to show Falcio she loved him and viewed him as her father, but instead she constantly acted ungrateful towards him. And I get that it was completely sad and unfair that she was lied to all her life, but then she just accepts taking Jillard’s name and happily rules her new Duchy. I don’t know, it just feels sort of bad. ➽ Ethalia – Okay, I agree, her being pregnant with Falcio’s baby (girl, too) at the end was a little cheesy. But hell, after seeing Falcio finally say he was lucky after all the torment, suffering, and heartbreak he had to endure through his journey, I am happy for him. I am so very happy for him. Brasti becomes a Rangieri, Kest becomes a knight, and Falcio becomes a father. You know, I honestly didn’t see this ending coming, but I loved it all the same. These characters have become part of who I am as a person, and I will cherish this amazing quartet for as long as I live, while I sing its praises to every book lover I come in contact with. I can’t wait to see what adventure Sebastien de Castell embarks us on next! Also, on a completely personal side note, this book’s main protagonist has an abbreviated version of my favorite name of all time, Larkin. So, besides the enthralling writing, I was completely fangirling over the use of the name Lark, too, because I’ve never read a story using it before. ➽ Spinners – Have the ability to turn things into other things. ➽ Changers– Can shape shift into other animals. ➽ Healers – Are able to heal bodies and cure wounds. ➽ Tellers – Use magic words that compel people and things to do things. This magic is very much like casting spells, and very powerful. Lark is a Teller like her mother, and her mother pays the ultimate price for her carelessness to hide her powers. Her mother is killed by the King of Jeru, but not before she tells the King, Lark’s father, and Lark herself, a few prophetic things. Her mother’s premonition-like rhymes also makes Lark lose her ability to speak. We are then thrust into the future, where our dear Lark is still unable to communicate besides head nods. She does have an amazing Troll companion named Boojohni that I completely fell in love with. They sort of form their own way to speak, and he has become Lark’s only friend over the years. Then one day, while out in the forest, Lark stumbles upon a fatally injured bird. Even though she only has the voice inside in head, she tries to use her Teller powers to compel the bird’s body into healing itself. The next thing she knows, she is waking up in the forest and then is running home because the new King is arriving to meet with her father. Lark’s father, Corvyn, is a Lord and hasn’t sent any men to help fight against the Volgar. The Volgar are winged evil monsters that are lead by the Volgar Liege. Their numbers are constantly growing, and they are taking over more and more land. The new King, Tiras, son of the old King that killed Lark’s mother, captures Lark and plans to use her as hostage. 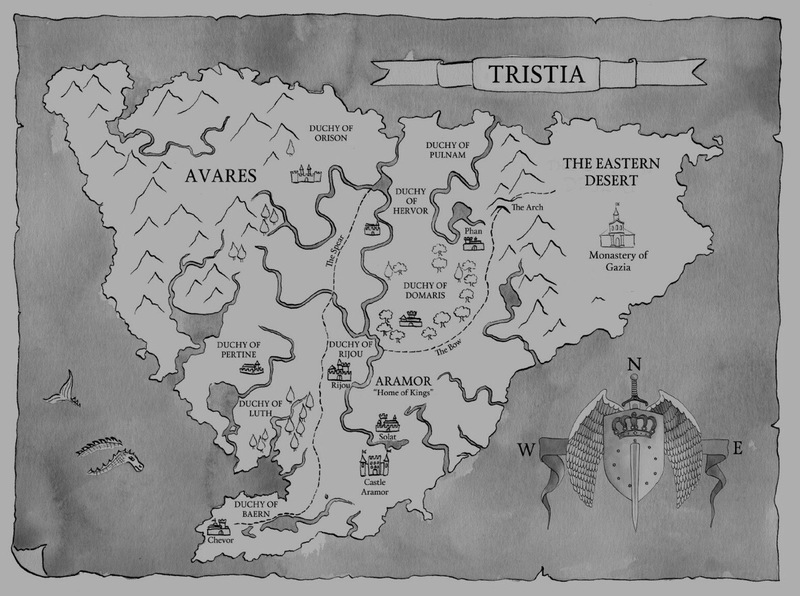 Tiras tells Corvyn that he can have his daughter back, once he sends his share of men to help defeat the Volgar. The characters are so very wonderful, and Lark is such a strong female character that learns her worth and won’t settle for less than what she deserves. 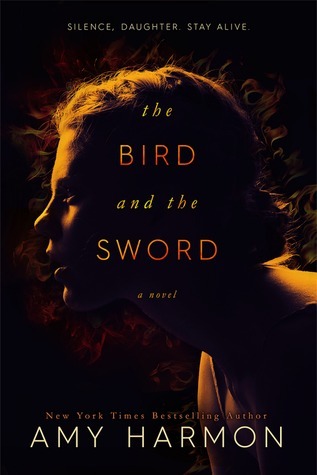 The story is fast paced and full of intrigue and mystery, while proving over and over that words are the most powerful weapon we will ever truly wield. The magic system is easy to understand, but still really enchanting. The romance in this book is seriously top notch, and if you guys are anything like me and some of your favorite parts of A Court of Mist and Fury were the ones where Feyre is taught to read, then you are going to freakin’ love some of the scenes in this book. Seriously, be still, my heart, because I’m still not over how heartwarming and perfect those scenes were. But seeing this original trilogy take place quickly in Kelsier’s perspective was something that I never expected and completely loved. And seeing his interactions with Preservation were something of magic. It also helped explain a lot, like the scene when Elend was stabbed at the well. Oh my God, I have no words for what this amazing new perspective gave me. And how the earthquakes were from Kelsier and Ruin fighting!? Oh my Lord. 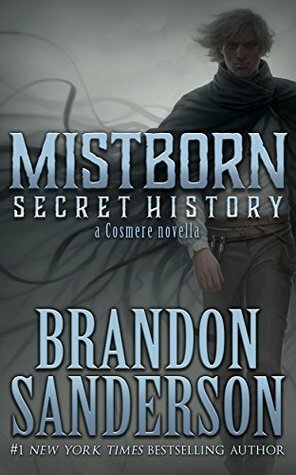 Who did Brandon Sanderson sell his soul to, to be able to write like this? Seriously, so impressive. And Vin, such a perfect little brave cinnamon roll, who was always too good for this world. Her choosing to go, when Kelsier feels unable to leave, God, I can’t. Brandon Sanderson is able to evoke such much pure emotion from me, because of these amazing and realistic characters he creates. This was a wonderful addition to this world, and I can’t recommend enough! I am so thankful to have read it, and it really made an amazing story even more spectacular! And that epilogue with Spook made me want to run to my bookshelves and pick up The Alloy of Law immediately. I have to start off this review by letting you all know that Sebastien de Castell is my favorite author, hands down. His writing is so beautiful, his banter leaves my sides hurting from laughter, his characters always find a way to weasel themselves into my heart, and his fantasy stories are a tier above anything else out there right now. He is such a clever and witty writer, and his books are exactly what I want and look for in my fantasy. Oh, and I get a little fangirly when I talk about him and his Greatcoats. So when I found out he was going to be writing a YA series, I knew I wouldn’t be able to resist picking it up. I also knew after page one, and seeing that Kellen is a mini Falcio, that I would completely fall in love with it. ➽ Jan’Tep – People that can wield magical powers. ➽ Sha’Tep – People that have failed their mage trials, have none or minimal magic powers, and are now servants to the Jan’Tep. That might mean being a servant in the home of a Jan’Tep family, or it might mean life forced to spend your days mining in the mines. Our main protagonist, Kellen, comes from one of the most powerful mage bloodlines in his clan. His father is renowned and feared by everyone, because he is so powerful. His mother is one of the most gifted healers ever known. His sister is the best and most magical student in his school, and she’s only thirteen. Kellen isn’t as lucky. In this world all children have six tattooed bands on their arms that need to spark and then that child will be able to wield that type of magic. Some only spark one band, many spark two bands, but only the most powerful are able to spark all six. Regardless of how many an individual is able to spark; you have to pass all four trials to become a Jan’Tep! And unfortunately Kellen hasn’t been able to spark any of the bands, and his sixteenth birthday, and the deadline to complete his trials in order to become a Jan’Tep are closely approaching. 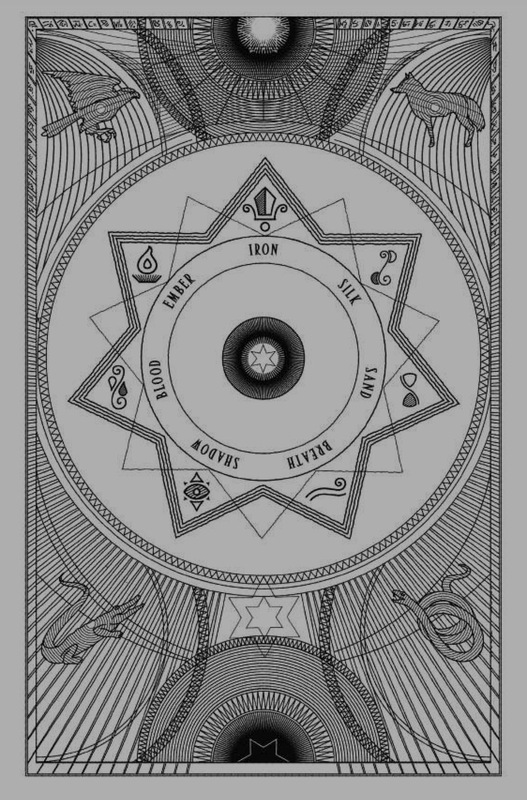 ➽ Iron – Shields and other protective magic. ➽ Ember – Fire and lighting magic. ➽ Silk – Mind manipulation powers and magic. ➽ Sand – Seeing afar and secret knowledge magic. ➽ Blood – Physical manipulation magic. ➽ Breath – Wind and air magic. ➽ Shadow – Magic of emptiness, of the void, and of all things demonic. Shadow is the band that the children do not have, and that’s because shadow is believed to be cursed and to drive the individual insane, while also encouraging them to perform evil acts. When the shadow decides to show in an individual, it doesn’t spark a band, but a blackness will show. These mages are called Shadowblacks and are hunted and killed. Kellen is so scared that he is going to be forced to become a Sha’Tep and never have the magical abilities that everyone else seems to have. He also is constantly dealing with feeling like a disgrace to his families’ name, because it feels like he will never be able to be what his family wants him to be. That is, until Ferius Parfax wonders into his town, and shows him that he can be anything he wants to be. Ferius is an Argosi, who draws maps of people and their cultures. Many believe they travel to witness great events. 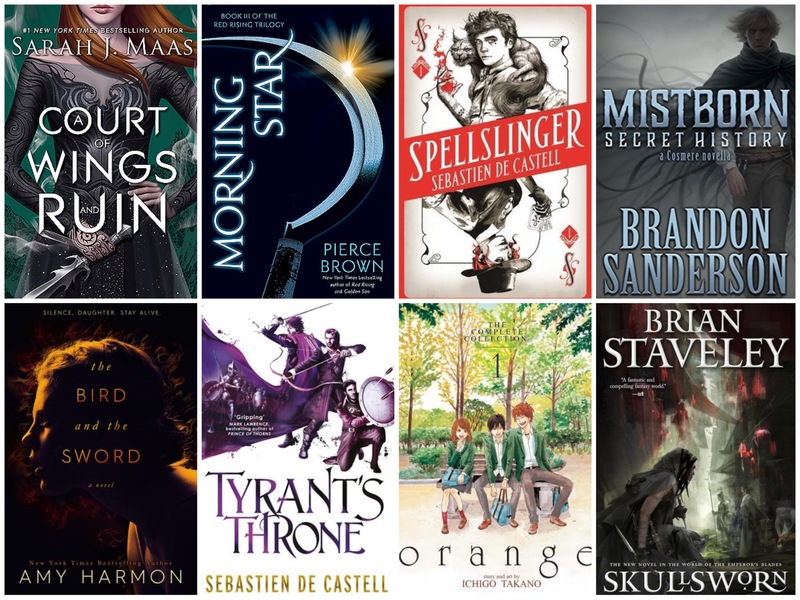 In true Sebastien de Castell fashion, I fell in love with so many of these characters, but Ferius completely stole my heart. Ferius is such a strong female lead, and there is so much more I want and need to know about her. Also, she wields a deck of cards. 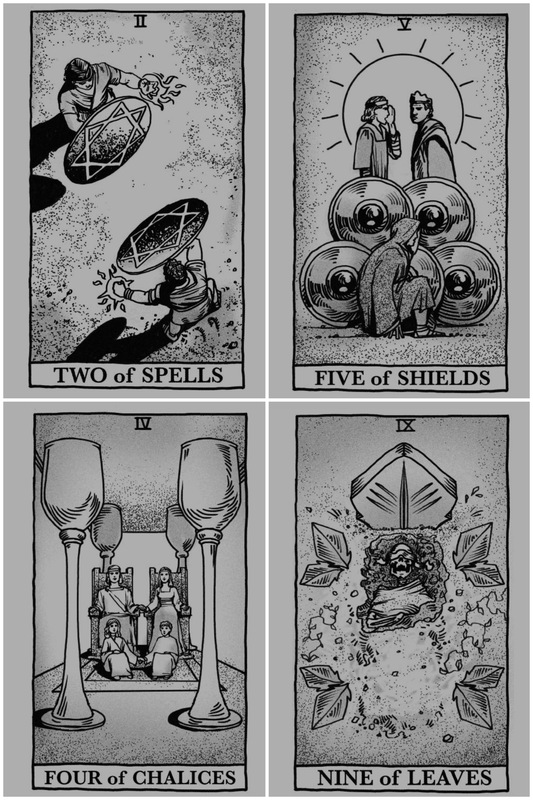 Yeah, think Gambit from X-Men and Twisted Fate from League of Legends, except tarot cards. I honestly want to be Ferius Parfax when I grow up. The Jan’Tep people also live in fear of another culture of magical people, even though they have been dead for a long time. The Jan’Tep people are taught about a war that involved them and the Mahdek, who would summon demons and commit other evil acts. You know, like Shadowblacks. The Mahdek people also would use these adorable very vicious squirrel-cats, actually named/called nekheks, to help them fight, so the Jan’Tep people are also very afraid of them, too! One particular squirrel-cat ends up playing a major role in this story, and his name is Reichis! I couldn’t help but picture Reichis as Rocket from Guardians of the Galaxy, even though I know he’s not a raccoon, but his personality is so reminiscent. Seriously, such an amazing character. I would completely read a whole book surrounding him and his family. Also, if I wasn’t completely sure about giving this story five stars before, Reichis’ mother completely sealed the deal. Also, I want to state a trigger warning for animal cruelty/abuse. This is normally a big problem for me, and it didn’t bother me too badly in this book, but that’s not to say that it won’t bother you. This book has a light amount of it, and nothing too graphic, but it is in a few scenes and I feel like it is very important to at least warn you guys. Kellen was so focused on trying to pass his mage trials and how not to be an embarrassment to his family, until some Jan’Tep people start losing their powers and many members of the clan begin to blame the mysterious Argosi woman who has just recently come to town. Which means Kellen is forced to figure out what really is happening to his people, while also trying to figure out who he really is himself. This story is so unique, the writing is so superb, and the message of this story is so very important. Accepting who you are is sometimes the hardest battle we will fight in this life, and seeing Kellen become who he is and not what others expect him to, whether it’s his family or the world, is something so beautiful that I don’t have words for. 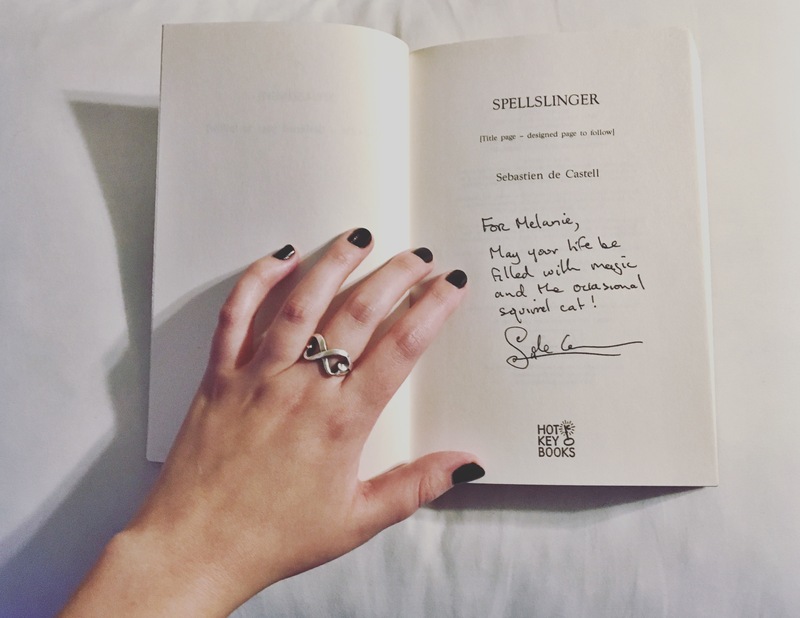 Thank you again, Sebastien de Castell, for another book that I will cherish for the rest of my life. I’m not sure what the world has done to deserve your stories, but I am so very thankful for them. I just wanted to write up a quick post about some people in the book community that mean an immense amount to me and deserve all the recognition in the world! These people are amazing reviewers, who are always honest and critical, and probably the reason my TBR shelf looks the way it does. I can count on one hand how many books me and Khanh disagree on. I trust her reviews more than I trust anyone’s in the book community, and I honestly live for her one star reviews. Not only is she the best reviewer I know, she is also a video game playin’, Harry Potter lovin’, bunny mom, too! Honestly, Mogsy is the SFF Queen! She is constantly reviewing the newest Sci-Fi and Fantasy and is probably the biggest reason my TBR shelf looks like it is about to break. Her reviews are so absolutely brilliant, and I hope to be half as good as her one day. Paloma is one of my oldest friends in the book world, and she has helped me more than she will ever know. 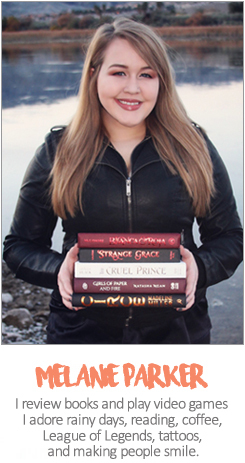 She has been on Goodreads reviewing for a long time, but has just recently started her own blog! She is so very lovely, and her buddy reads, gushes, and Snapchats mean so much to me. Bentley has some of the best and most important discussions in the book community, where he never shames or discourages anyone regardless of their opinions. He also writes outstanding reviews, and has some book aesthetics that are to die for. Sue is seriously the Queen of Romance and Erotica! She constantly is telling everyone on Goodreads about free books, and has the best naughty but addicting recommendations. She is also such a hard worker that is always promoting new or lesser heard of authors and doing giveaways for them. Some of my best bookish moments of 2017 have been buddy reading books with him. Petrik started blogging at the end of last year, but his content is phenomenal. I’m also completely biased, because, like Mogsy, Petrik reads everything I read and/or want to read. Mary is a little busy with school right now, but is my go to for manga, anime, light novels, otome, and all things Japanese to be honest. She’s stunning and has such wonderful content that has helped me so very much. Okay, I could probably make a post by itself about Cory, because she has quite literally changed my life, but I’ll try to keep it short. Navessa is her pen-name, because she is also an amazing writer on top of being one of the best reviewers on Goodreads. She also posts her reviews on The Alliterates with Khanh. And she is also the reason why I am a feminist, because she opened my eyes at a time in my life when I was choosing to keep them closed. She is such a beautiful human and I have no words for how impactful her and her reviews have been on me.